In the Entire World, Is there Anybody Who Is Suprised that Obamacare Is Turning Out to Be Far More Expensive than the President Promised? Washington is filled with people who exaggerate, prevaricate, dissemble, and obfuscate. And those are the people I like. The ones I don’t like are much worse. That’s why, during the Obamacare debate, I warned that the numbers were utterly dishonest. We were told, if you remember those grim days, that adopting a giant new entitlement somehow was going to lead to less red ink, but I doubt anybody with an IQ above room temperature actually believed that nonsense, notwithstanding the supposedly non-partisan estimates from the Congressional Budget Office and the Joint Committee on Taxation. Well, Obamacare was enacted and we’ve already seen evidence that supporters were being less than truthful. "I'm shocked, shocked, that Obamacare is more expensive than the original forecasts"
And now there are additional re-estimates suggesting the problem is much worse than even critics feared. 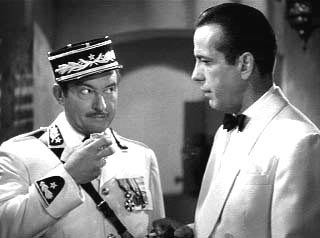 One wonders whether supporters of the legislation will now imitate Inspector Renault from Casablanca and pretend that they are surprised about this outcome. Here are some excerpts from an Associated Press report about these “surprise” findings. Cost estimates for a key portion of President Barack Obama’s health care overhaul law have ballooned by $111 billion from last year’s budget… the estimated cost of helping millions of middle-class Americans buy health insurance has jumped by about 30 percent for an eight-year period, from 2014-2021. Administration officials say the explanation lies in budget technicalities and that there are no significant changes in the program that would raise concerns. …Cost overruns for the health care overhaul could create new political problems for Obama by undermining the law’s promise to reduce federal deficits. The revised health care numbers, buried deep in the president’s budget, stumped lawmakers and some administration officials earlier in the week. At a congressional hearing Tuesday, Health and Human Services Secretary Kathleen Sebelius, who is in charge of carrying out the health care law, indicated she was unaware of the changes. …Last year’s budget estimated the cost of the aid to be $367 billion from 2014-2021. This year’s budget puts it at $478 billion over the same period. A mature and dignified person would resist the temptation to say “I told you so.” But I’m neither mature nor dignified, so here’s an encore edition of my video on the Obamacare cost estimates. This is a case, though, where I wish I had been wrong. Unfortunately, if you’re predicting bad results from government intervention, you’re on firm ground – especially if politicians are trying to deal with a mess caused by previous forms of government intervention. Posted article and “Zorba’s” response in my “Wisdom from the web” feature focused specifically on great comments. As always a great read Dan. This is the same bait and switch that they do at the sleezy car dealers. I’ve already had about all the rescuing I can stand. You have not seen anything yet on ObamaCare — and it’s main effect in prosperity suppression will never be seen, just as Europeans never saw it. It is the effect on perpetually compounding lower growth rates, as the effort- reward curve flattens to European levels, as exceptional work is trimmed to insulate a majority from the consequences of lifetime mediocrity — a mediocrity supported by the various “care” packages. — many more to come as the desperation of decline will inevitably trigger calls for more packages at the polls. Nothing is quite as pivotal and as irreversible in america’s decline as ObamaCare. That will be the main effect and consequence. But few will recognize it as such. The decline though will be real and felt. Welcome to Europe. Expecting realistic estimates of costs is unrealistic in and of itself. The Austrian school of economics is based on the idea that things are too complex to EVER estimate the outcomes. Billions or trillions of interactions between self-interested parties will probably always be beyond our ability to predict. The stupid factor is involved in expecting the government to understand that or to care about it. They only wish to convince the sheeple that they know best. What right thinking person would believe “We have to vote for the 2000 page bill so we can see what is in it… and do it NOW or the sky will fall”. It fits perfectly with “Too big to fail”. Yeah, right, like the Roman Empire was too big to fail? Great accompanying picture from Casablanca!